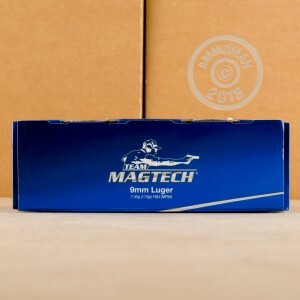 Magtech "Shootin' Size" ammo packs are designed to reflect realistic round counts at range sessions, which typically last far longer than 50 rounds. 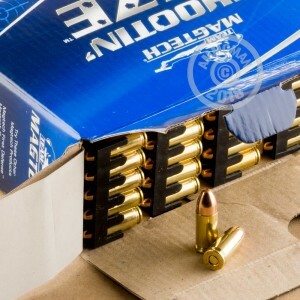 This pack of 250 cartridges in 9mm Luger is a great way to get some trigger time in on a budget. These cartridges use the popular 115 grain bullet weight and generate an above-average 1,135 feet per second of muzzle velocity. 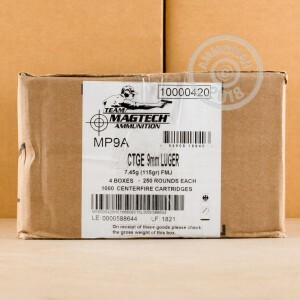 Magtech ammo is made in Brazil by leading defense contractor CBC, the largest ammo manufacturer in Latin America, and uses non-corrosive Boxer primers and brass cases. Stock up at AmmoMan.com to reap some major savings. We provide free shipping for all orders over $99 so you can focus on the fun stuff: shooting! Bottom line.... Would definitely buy again and definately from Ammoman. Great fast shipping. Ran thru my S&W Shield with no FTF or FTE's. Surprised that ammo of this quality being priced so competively. If there is any negative it is probably just my preference issue......the ammo is packaged in one carton where you stand it on its side and you open the top and actually slide out each of the 50 round plastic trays like drawers. Not individual boxes of 50 rounds. If you were going to shoot the whole 250 at one range visit it is neat. I shot one tray and after doing so you must be careful how you carry the box so they don't dump out of the remaining trays, minor issue but I prefer individual boxed 50 rounds.